Conceived as a replacement for the 10,000dwt, 10kn WW2 Liberty ships with steam reciprocating engines, a total of 211 Shelter Deck 14,000dwt, 14kn cargo vessels (SD14) were built between 1968 and 1988. Of these, 126 were constructed in Sunderland by designer Austin & Pickersgill and associated company Bartram, six to a similar design by Smith’s Dock on Teesside, three at Robb-Caledon in Dundee, and a further 76 under licence by builders in Greece, Brazil and Argentina. Full details of all the ships built and their careers, plus illustrations, are given in John Lingwood’s splendid book, SD14: The Full Story. Further information on their contracting and delivery is contained in files on most of the Sunderland-built ships in the Marine Technology Special Collection at Newcastle University and in Tyne & Wear Archives, not previously published. They give an insight into a successful design which sold worldwide, was generally delivered on time and usually made a profit for the builder – not always true of British shipyards at that time. Many of the early orders were for Greek shipowners, encouraged by Basil Mavroleon of London & Overseas Freighters, the company that owned the A&P shipyard until it was nationalised under British Shipbuilders in 1977. The contract price in sterling was derived from a basic price for a somewhat austere specification. However, it was always recognised that there would be owners willing to upgrade the specification, so a list of ‘optional extras’ with prices was provided. Accepting any of these at pre-contract stage meant they could be added as an allowance for extras to the basic price and thereby included in financial and credit negotiations, so that the owner more or less knew what their total outlay would be. Modifications agreed after contract (and there were often quite a few) had to be paid in cash. The final price would be adjusted up or down if the actual extras and credits came to a higher or lower figure. Typical extras included full air-conditioning in the accommodation, tunnel side tanks (which levelled off the bottom of No.5 Hold into which the shaft tunnel protruded), CO2 fire extinguishing system in the cargo holds, masthouses for the cargo winches (otherwise on the upper deck) and additional spare parts. The higher class owners who anticipated charters to liner companies would add further extras such as 10ton derricks in place of 5ton, a heavy lift derrick (typically 30-80tons), more powerful diesel generators (e.g. 3 x 350kW in place of 3 x 280kW), additional crew accommodation, a higher paint specification, St Lawrence Seaway fittings, better navaids (though sometimes these were owner’s supply if they had leasing arrangements), bridge automation and a sewage system. For the basic ships, such extras might be as little as 1-2% of the contract price, while in the higher class ships, around 14-16%; most, however, were in the 5-9% range. 1% commission was typically paid to any sale and purchase shipbroker involved. Over the years the specification improved, with four series being designed. 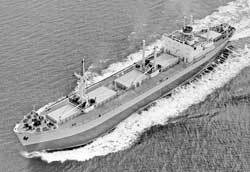 With the change in freeboard from the 1966 Load Line Convention, the draft and deadweight increased before the first ship was delivered, so the latter typically became about 14,900tons – about 240 higher when expressed in metric tonnes. The early ships had 5-cylinder Sulzer 5RD68 engines of 5,500bhp, but 1971 deliveries received the 5RND68 engine of 7,500bhp, which gave 14.9knots when loaded. From about 1978 the 4RND68M engine of 7,600bhp gave a similar speed. Most of the engines were built by George Clark & NEM at Wallsend or Hawthorn Leslie at Newcastle, but installed by A&P. The main engine made up typically 12-18% of the price. The contracts (building agreements) were fairly standard, with instalments payable typically being 5% on contract signing, 15% when 20% of the steel had been delivered, 15% when steel erection commenced, 15% when 1/3 steel erected, 15% when 2/3, 20% when launched and 15% when accepted. Up to about 1976, loans of 80% of contract price were generally available from a merchant bank in London, often Williams and Glyn (which became a subsidiary of the Royal Bank of Scotland from 1979). Later, loans of 70% over seven years were offered. For overseas buyers, such loans could be insured through the UK Export Credits Guarantee Department which charged a premium of typically 2.5%. The delivery date was specified, but liquidated damages for late delivery could be as low as £75 per day reckoned after the first 30 days, up to £500. If the ship was more than 12 months late, it could be rejected with the shipbuilder returning monies paid back to the owner and the bank, but receiving title to the ship, which could then be resold. The agreement included a bonus (or penalty) for each ton deadweight more (or less) than contracted, typically at £80 per ton, but only payable after a margin of 100 tons. There was also a modest penalty (liquidated damages) if the speed on trial fell more than 0.25 knots below contract, at about £2500 per 0.25 knot, with the right to reject the ship if it fell below 1 knot – unheard of for SD14s. There was also a fuel oil consumption guarantee, but this was more an issue for the engine builder and designer. The guarantee against defective material or workmanship covered 12 months after delivery. Most contracts were fixed price (before extras and credits) so A&P only took orders about two years in advance as production slots could then be guaranteed and there was less risk of inflation. But with rapid inflation in the UK in the early 1970s, some price variation clauses (escalation) were included covering about half the total cost – both wage levels and steel prices had doubled in the UK over four years to the early 1970s. Final prices to the shipowner as delivered (i.e. excluding any subsidy such as Intervention Fund payments paid to A&P) are available for most of the Sunderland built ships. As can be seen from the figure, the price increased from about £950k to about £6M over 15 years, mostly due to inflation but also to improved specification and new regulations. A few low prices were not typical, e.g. resales during freight market slumps, while higher ones often reflected more extras. Man-hours to build early SD14s were typically about 250,000, giving profit margins of around 10%. But the man-hours rose up to about 400,000 for later, admittedly more complex, ships, often resulting in a loss in those more competitive markets. The actual delivery date would be proposed to the owner a few weeks beforehand, usually with ship handover at Sunderland. This would be a few days after the ship had been drydocked for about 4-6 days for final painting and underwater work, often on the Tyne. A large number of certificates were required from the shipbuilder and the classification society by the shipowner, bank, ECGD and their solicitors. The acceptance form (with place, date and time) would be signed by a senior member of the shipowner’s staff, sometimes an engineer superintendent, after the final instalment had been paid. The trials were run often only one or two days earlier, nearly always in a single day, with anchor and steering gear trials in the morning and speed and endurance trials in the afternoon (at typically three rpm on the Newbiggin measured mile north of the Tyne). Insurance was arranged for the trials and all personnel on board. A typical head count was about 112 – 6 A&P directors and managers, 6 design/drawing office staff, 7 foremen, 13 engine fitters, 13 riggers, 13 tradesmen (such as joiners, plumbers, electricians, shipwrights and painters), 6 engine builders staff, 19 subcontractors’ representatives, 7 owners, 8 ship’s crew and 14 caterers – extra lifesaving equipment being required compared with the usual two 31-man lifeboats. After handover, the ship would usually sail the next day – often with a charter already fixed. Derek Kimber (a past President of RINA) and Mervyn Hargroves give details of the extended A&P shipbuilding facilities at Southwick – the former Bartram South Dock yard had closed in 1978. By the early 1980s, the simple tweendecker with limited container capacity had given way to the full container ship, the bulk carrier and the multi-purpose ship with substantial crane and container capacity. The last SD14s were scrapped about 2015, often after half a dozen name/ownership changes.